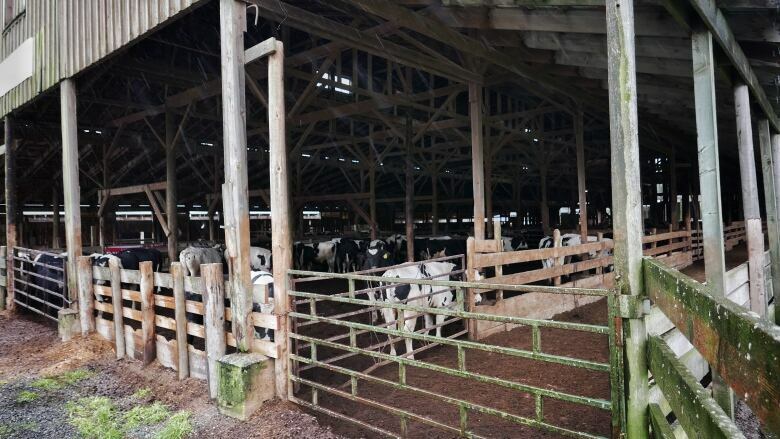 A family-owned feedlot in South Surrey is believed to be the source of strong odours that have triggered numerous complaints from neighbours. Its owners have been sent multiple warning letters over non-compliance by the Environment Ministry. A South Surrey farm at the centre of controversy over a mysterious odour has violated repeated orders under B.C. 's Environmental Management Act, according to the province. 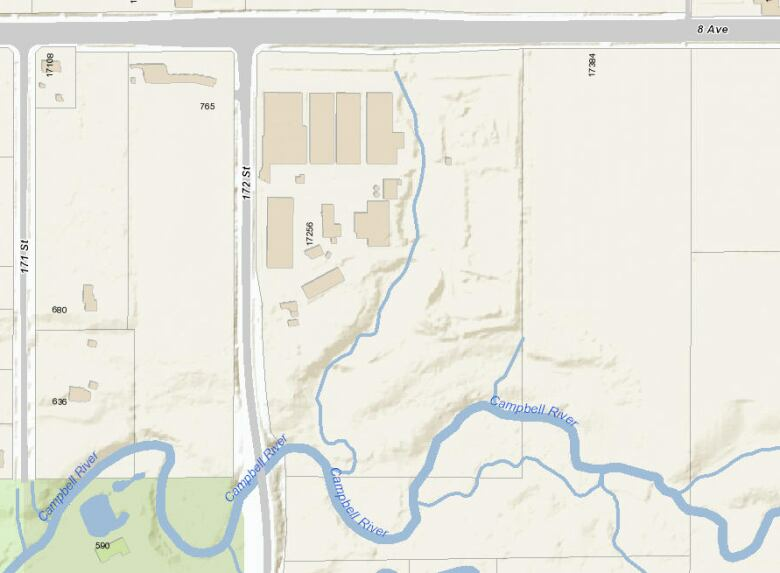 Infractions have been piling up against Border Feedlot Co. going back 20 years when the owners were first fined with polluting a nearby river. Since then, the Ministry of Environment has issued multiple warning letters to the operation on 172 Street and Eighth Avenue. In an email to CBC, Sandra Baird, director of J. Baird Cattle Co. and secretary of Border Feedlot Co. — two companies that operate on the same property — said her family has been in the cattle business for more than 50 years, but worries the next generation of farmers is in jeopardy. In 1996, the farm started composting to augment dwindling profits from the cattle industry, according to court documents filed by the family. Now, they sell everything from steer manure to topsoil. 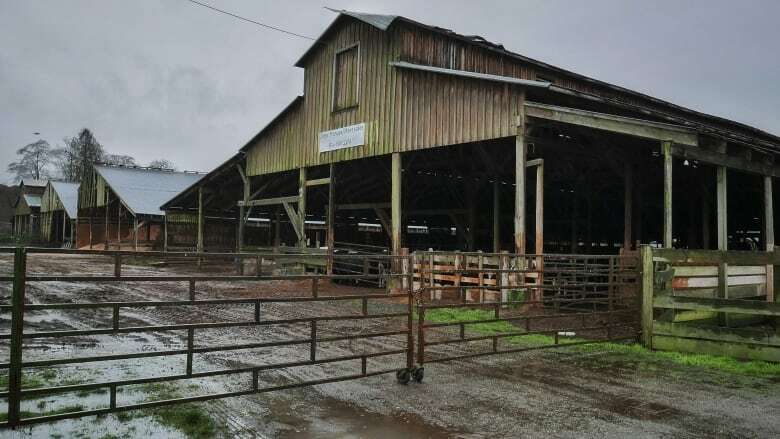 "We're working hard to continue the cattle business and farming on this property," Baird said, referring to the many complaints and accusations. She said her farm is working with the ministry to deal with the growing number of complaints. She said it's been "stressful" for the family because of increased development around their property. "We would like to get along with our neighbours and solve any issues. We would also like to be able to make a living farming." In 1998, the company was ticketed $575 for discharging business waste into Little Campbell River, which runs through the property. In 2007, a provincial audit named the feedlot as one of the region's worst violators of environmental compliance. In 2017, three inspections by the Environment Ministry led to warning letters in March and August outlining multiple offences under the Environmental Management Act. The reports revealed what the ministry called poor agricultural practices. 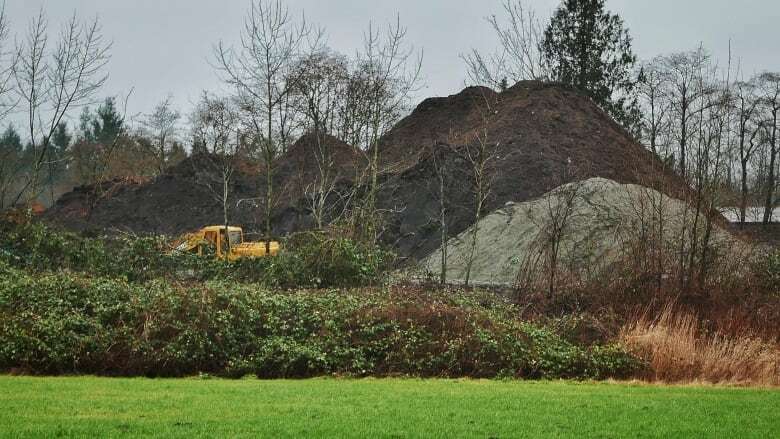 This included manure blocking a ditch feeding into Little Campbell River, agricultural and commercial waste (including — in some cases — offsite drywall, gravel and sand) pumped onto fields, and unprotected waste piles stored on unpaved ground which could leach into the soil. The region of Metro Vancouver, which monitors air quality standards, said there have been more than 250 complaints against the property in the past two years. Cynthia Adams is one of dozens of neighbours living in a development a few blocks south of the property claiming the stench is making them sick. "It smells like rotten eggs. You can also smell raw sewage. It's like standing in an outhouse," said Adams who describes a sore throat and breathing problems that she says worsen when the smell is strongest. The community started a Facebook group to document odours, dates and possible health effects. "Personal messages of people describing how they aren't feeling well, young children, older people, those with asthma." said Adams. In the past two years, officials confirmed that residents have filed multiple complaints to the City of Surrey, the B.C. Ministry of Environment, Metro Vancouver Regional District, Environment Canada and the Agricultural Land Commission. A Metro Vancouver Regional District official suspects some type of sulphide — possibly hydrogen sulphide — is coming from the property and is investigating. One expert said that health issues are a possible side effect of agricultural composting. John Paul, the founder of Transform Compost Systems, has 30 years of expertise. He's often called in to help farm operators fix problems with their systems, especially if there are complaints to WorkSafeBC about potential health risks. 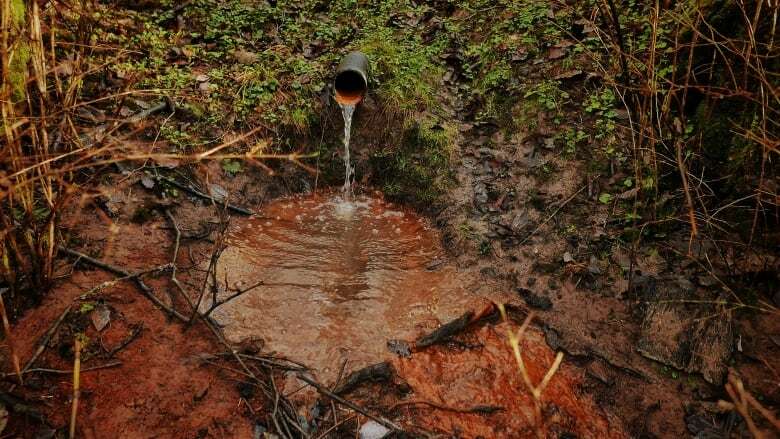 He pulled over while driving by this property recently after smelling what he believed to be hydrogen sulphide, which can be released from composting material like mushroom manure. "It can accumulate in depressions or piping or lower places," he said. Inhaling this gas can cause headaches, breathing problems, throat irritations and nausea, according to Environment Canada. 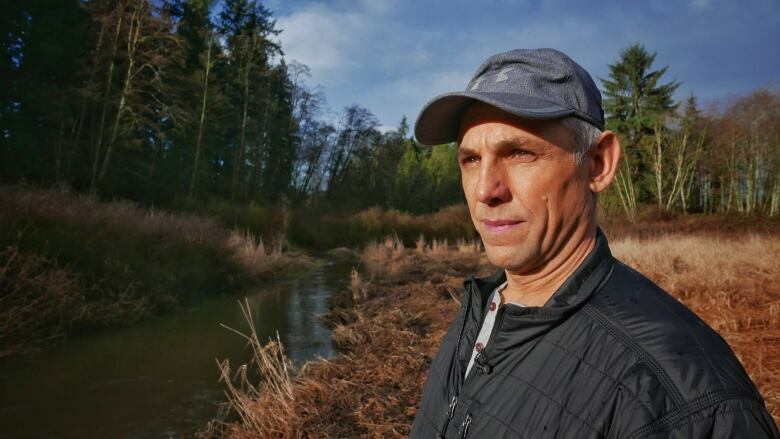 Eric Stausgaard says his son catches salmon and trout in Little Campbell River, but fears pollution from a pipe flushing the perimeter of the feedlot may be harming local waterways. He believes quality of life is being affected — not just for humans but for the entire ecosystem. "As this area grows and more people move here, they want to be able to enjoy the environment they live in. I mean, it's a beautiful area," he said. Adams, who's noticed the smell has worsened in the last two years, said she doesn't mind the smell of a little manure but adds that any damage to the air, land or river is an "environmental injustice." "It looks idyllic when you come down here. It's very special. It's very unfortunate the feedlot is stinking us out."